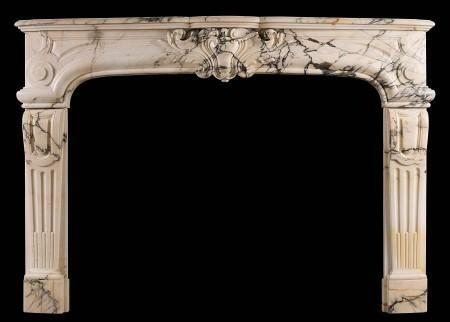 Thornhill Galleries offers an impressive selection of Louis XIV, Louis XV and Rococo antique fireplaces. The French style of the 18th century perfectly encapsulates majesty and opulence. In his reign, Louis XIV sought to make Paris the center for design, and he recruited the most talented artists and artisans of the period to ensure this happened. He made a conscious effort to fund the decorative arts to ensure they represented his own supremacy. Throughout the 18th century, French chimneypieces would have been full of extravagant formality, made less severe by arabesque lines as highlights. Gilt and ormolu would often have been liberally applied to increase splendour and shine. Louis XV and Rococo fireplaces used stylised nature motifs with S and C scrolls to create a sense of movement and intimacy. They focused on the whimsical, the fantastical and the intimacy of smaller social spaces, as the salons of Paris became the centre of social life in France, rather than the opulent courts of Versailles. As such they were influenced ultimately by the aristocracy of Paris, rather than King Louis XV, who unlike his great-grandfather Louis XIV had no direct interest in patronising the decorative arts. For more info on these fireplace styles, please see below. 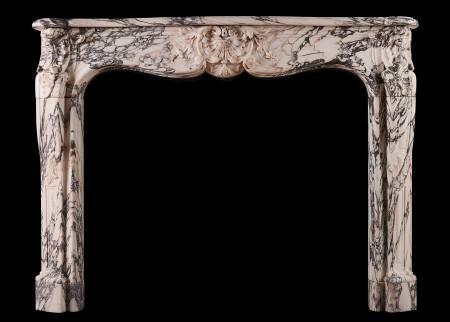 A good quality copy of an 18th century French transitional Louis XIV/XV marble fireplace. The shaped frieze with cartouche centre with scrolls and leaves, juxtaposed by moulded panels. The shaped jambs with stiff acanthus leaf and scroll bases, surmounted by leaf, shells and filigree blockings. 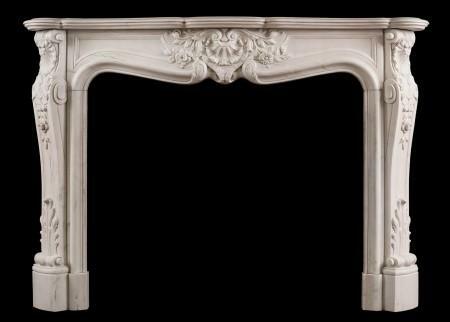 A richly carved Louis XV style fireplace in white marble. The flowing frieze with carved shell, flowers and foliage, shaped jambs with scroll and shell to top, leading the floral drops and stiff acanthus leaves below. Serpentine shaped shelf. The Rococo influence displayed in the Louis XV style of the early 18th century reflects the reaction against the symmetry and regulation of the Baroque period. A copy of an original antique. 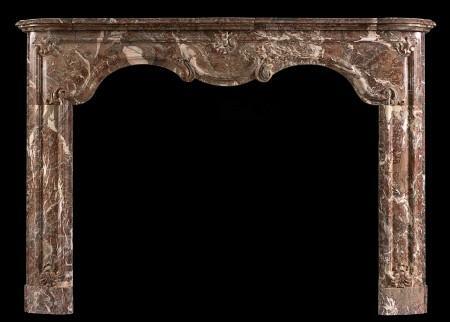 A fine quality French Louis XV style marble fireplace in a striking black marble with orange/gold veining. The panelled frieze with carved shell to centre flanked by foliage and belldrop below. The shaped jambs with stiff acanthus leaf to base surmounted by cartouche with shell and scrolls above. Heavy, shaped moulded shelf above. A copy of an original. N.B. May be subject to an extended lead time, please enquire for more information. 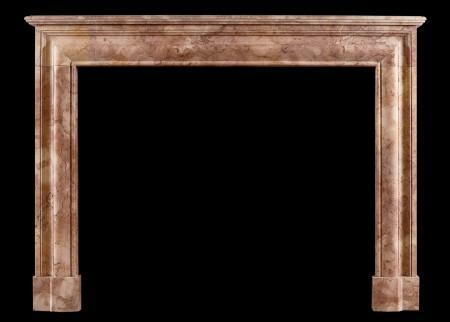 A very fine quality French Louis XV style marble fireplace in Italian Arabescato marble. The panelled frieze with carved shell to centre flanked by foliage and belldrop below. The shaped jambs with stiff acanthus leaf to base surmounted by cartouche with shell and scrolls above. Heavy, shaped moulded shelf above. A copy of an original. 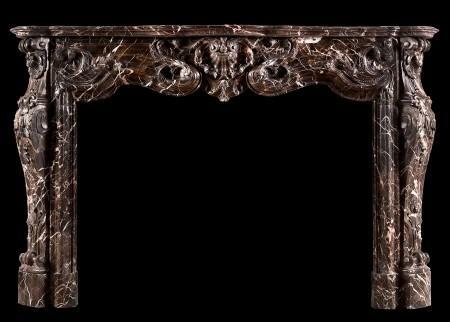 A very fine quality French Louis XV style marble fireplace in rich brown Emperador marble. The panelled frieze with carved shell to centre flanked by foliage and belldrop below. The shaped jambs with stiff acanthus leaf to base surmounted by cartouche with shell and scrolls above. Heavy, shaped moulded shelf above. A copy of an original. 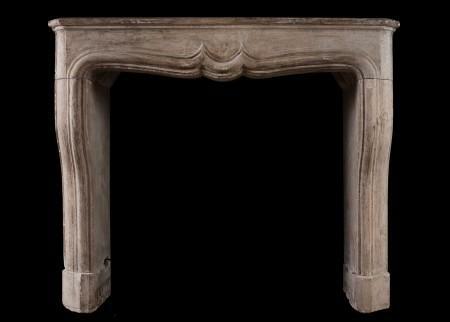 A substantial French Boudin fireplace in light travertine stone, with moulded jambs and shaped moulded frieze. An imposing yet graceful piece. A copy of an original. 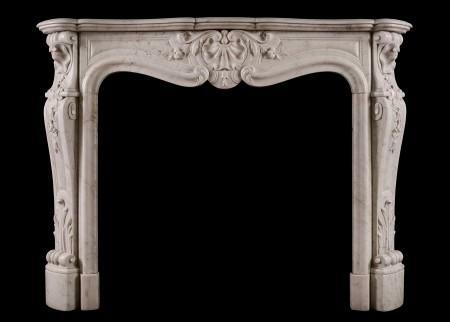 A 19th century French Louis XV style fireplace in Carrara marble. The shaped, panelled jambs with scroll motif. The panelled frieze with delicate carved shell to centre and shaped end blockings. 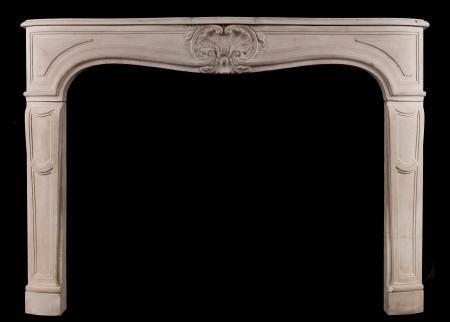 An impressive Louis XIV style fireplace in Breche Violette marble. The stop fluted and panelled jambs surmounted by arched, panelled frieze. Moulded shelf above. 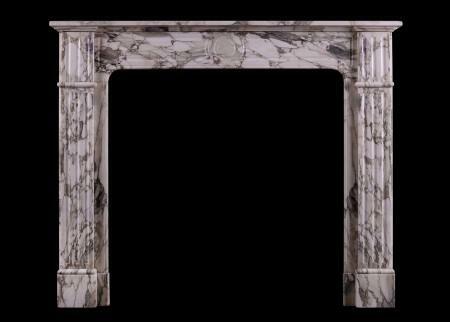 A substantially deep fireplace in an attractive marble. French, 19th century. 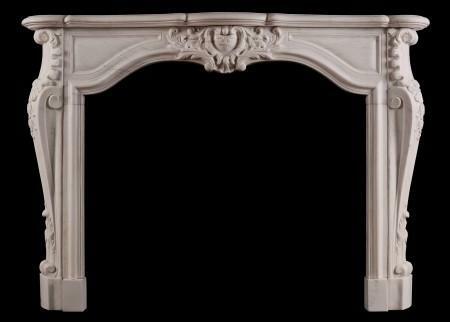 A very fine French Louis XV style fireplace in Paonazzo marble. The panelled frieze with carved central cartouche, foliage and shells, flanked by rosette paterae. The jambs with scrolls to base, surmounted by stiff acanthus leaves, foliage and shells. Shaped moulded shelf. Good quality Italian marble. Early 19th century. 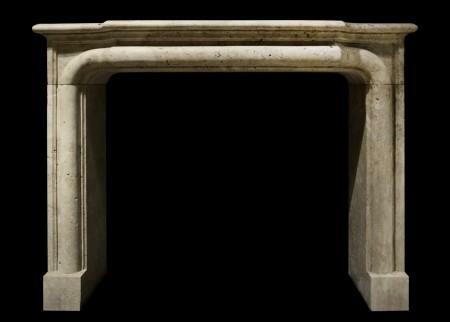 A period transitional Louis XIV/XV French limestone fireplace. The stop fluted jambs with panel above, surmounted by arched frieze with carved shell and foliage to centre. Shaped shelf above. A nice aged patina to stone, but could be restored further if required. With original shaped cast iron ‘contracoeur’ insert. French, 18th century. Opening sizes inside cast iron insert – 690mm wide x 656mm high. 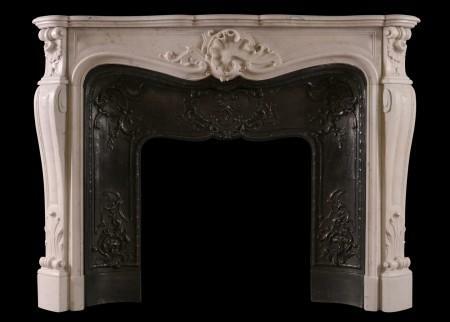 A French Provençale Louis XV style fireplace in Breche Violette marble. The carved, shaped jambs surmounted by panelled frieze with carved cartouche to centre. Moulded shelf above. Good quality Breccia marble. 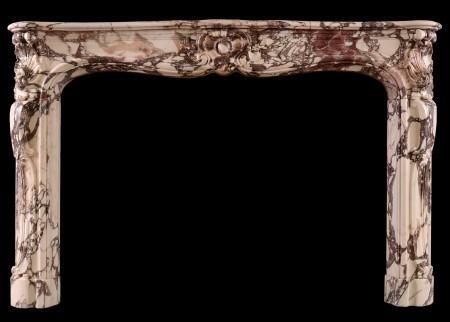 A French marble fireplace in the Louis XV manner. The shaped jambs with stiff acanthus leaves surmounted by carved bellflowers, scrollwork and foliage. The frieze with cartouche to centre flanked by foliage. Shaped moulded shelf above. French, 19th century. 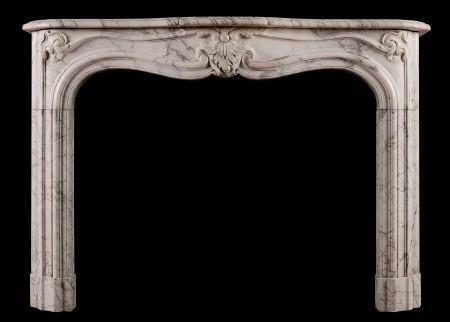 A 19th century French Louis XV style Carrara marble fireplace. The shaped, panelled jambs surmounted by carved frieze with shell and foliage to centre. Unusual centre carving. Shaped, moulded shelf. With original cast iron contrecurve interior. 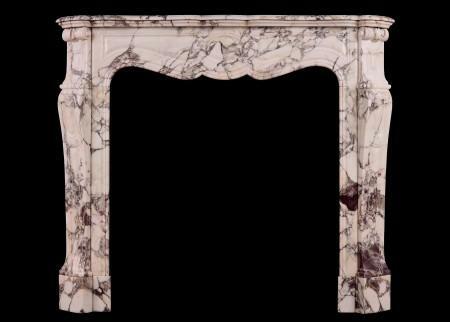 A period 18th century French, Louis XV fireplace in Breche Violette marble. The scrolled jambs surmounted by carved shells, the panelled frieze with central cartouche. Shaped, moulded shelf above. An impressive, striking piece in an increasingly rare material. 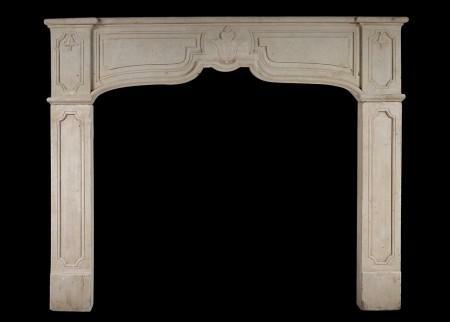 A rustic French limestone fireplace in the Louis XV style. The shaped frieze with attractive carved shell to centre, flanked by scrolls, rosettes and shaped panels. Shaped panelled jambs. Well suited to a bedroom or study perhaps. 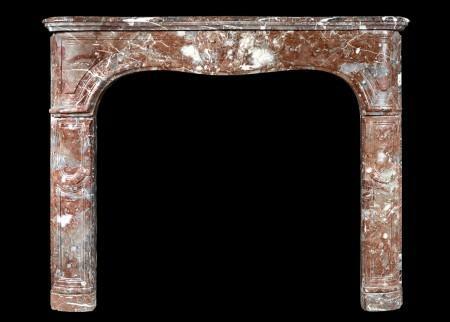 A Napoleon III fireplace of architectural form in Rosso Verona marble. The frieze and jambs with bolection detail and plain returns. Moulded shelf above. French, late 19th century. 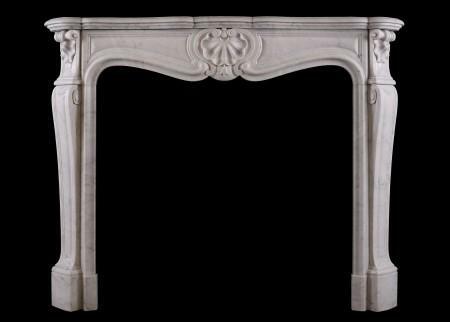 A heavily carved 19th century Statuary white marble fireplace in the Louis XV manner. The jambs with stiff acanthus leaves to base, surmounted by bell flowers and scrollwork. The frieze with carved shell to centre flanked by scrollwork and leaf work. Shaped, moulded shelf above. French, circa 1840. 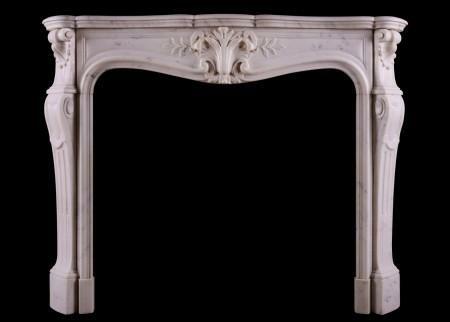 A 19th century French Louis XV style fireplace in Carrara marble. 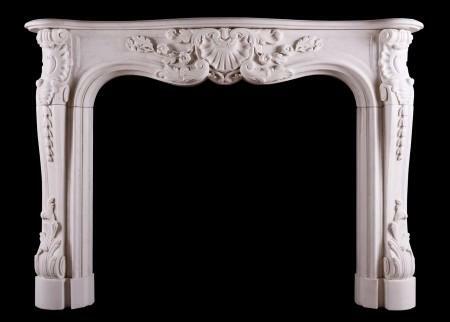 The jambs with stiff acanthus leaves to base, surmounted by carved shell and scroll work. The panelled frieze with carved shell to centre, flanked by foliage. Shaped, moulded shelf. Panelled outgrounds. 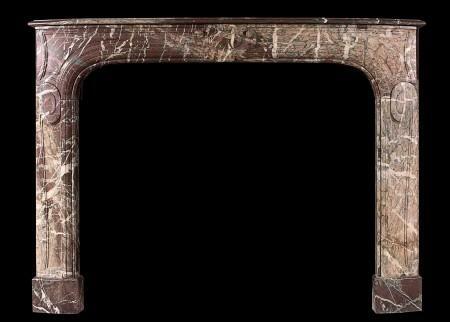 A Green Serravezza Breccia marble fireplace in the Louis XVI manner. The fluted jambs surmounted by panelled, fluted frieze and moulded shelf. The returns with original brass vents to sides. French, 19th century. 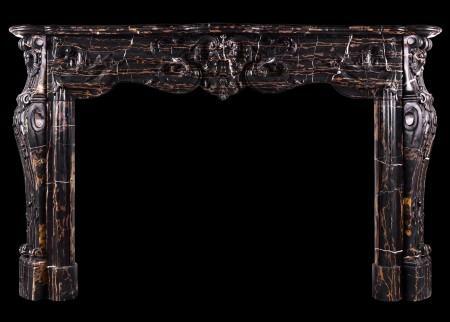 A period 18th century French Louis XIV stone fireplace. The moulded jambs surmounted by elegantly shaped frieze and shelf. Still at original depth, but could be reduced if necessary. 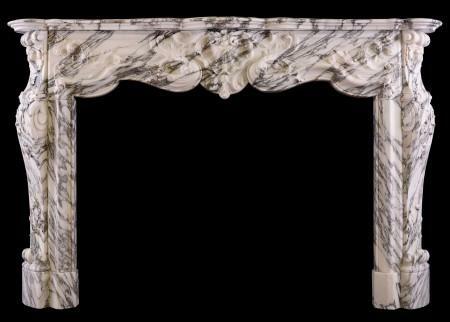 A charming French Louis XV fireplace in luscious Breche Violette marble. The shaped frieze with carved central shell and trailing foliage, scrolled detailing to ends with panelled jambs and unusual detail of carved leaf between panels. Serpentine shelf. Late 18th century. 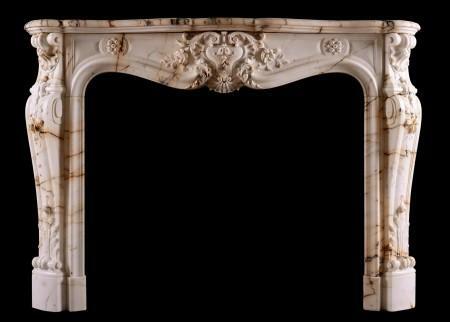 A good quality Rococo Louis XV fireplace in Italian Arabescato marble. The elegantly shaped frieze with panels and carved foliage to centre and interesting mouldings to jambs. Shaped, moulded shelf above. French, 19th century. A 19th century Statuary marble fireplace in the Louis XV manner. The shaped, fluted jambs surmounted by scrolled shells, the frieze with central cartouche flanked by leaf work. Shaped shelf above. French. A charming Louis XV in French limestone. The gently sweeping serpentine frieze with carved shell to centre, flower paterae and entwined motifs to panelled frieze and curved jambs. From the Lorraine region in North Eastern France. Period, mid 18th century. 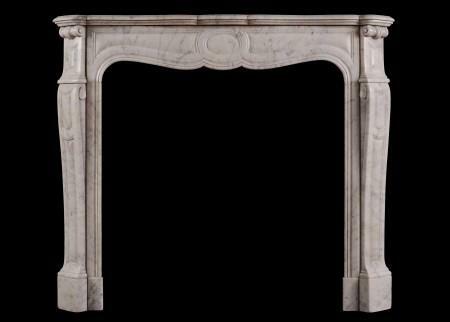 A French antique fireplace in the Louis XIV / Louis XV transitional style, made from Italian Pavonazzo marble. The arched frieze with carved cartouche and foliage to centre flanked by shaped panels and scrollwork. The shaped, panelled jambs with tapering stop flutes below. Shaped, moulded shelf above. Original brass side vents to outgrounds. Circa 1860. 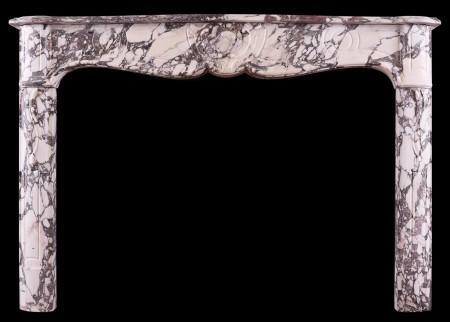 A period 18th century French Louis XIV Ribonned Campan marble fireplace. The panelled jambs with scrolls to top, surmounted by frieze featuring carved cartouche to centre. Shaped shelf. This dramatic marble showcases an impressive range of colours – from deep reds to soft salmons to light greens. From Espiadet, Campan in the Pyrenees, France. 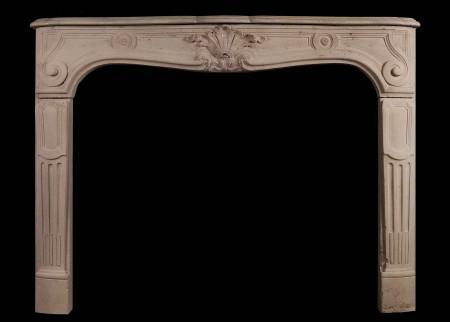 A petite 19th century French fireplace in Breche Violette. The shaped, panelled jambs surmounted by scrollwork, the panelled frieze surmounted by shaped, moulded shelf. Very fine quality Breche Violette marble. 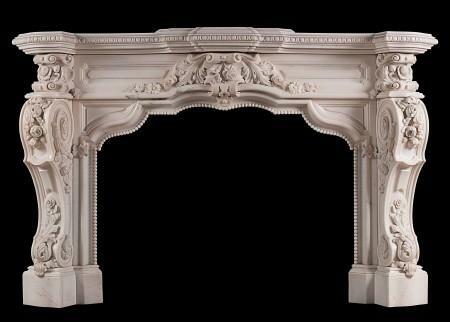 A very impressive French Rococo fireplace carved in Statuary marble. The panelled frieze and bracketed jambs delicately carved with trailing flowers and foliage. The serpentine shaped opening with beaded detailing, the shaped moulded shelf with carved egg moulding. Circa 1850. 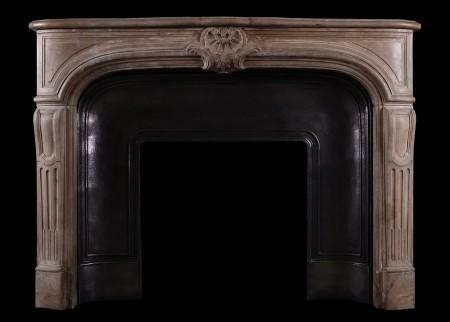 A period 18th century Louis XIV/XV transitional fireplace in Languedoc marble. The shaped, panelled frieze with carved foliage and rosette to centre, the panelled jambs with matching carving to base. Shaped, moulded shelf. An elegant piece, circa 1715. 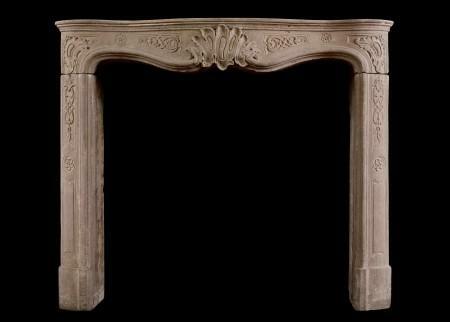 A 19th century French Louis XV style limestone fireplace. The panelled jambs surmounted by sweeping frieze featuring carved shell and foliage. Shaped shelf. 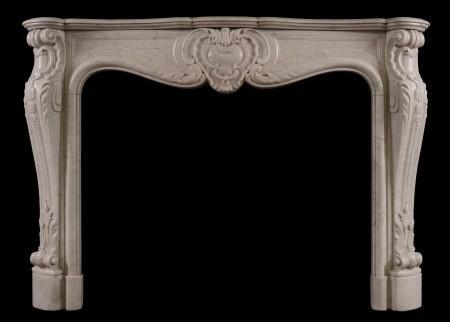 A French Louis XV antique stone fireplace. The tapering, stop-fluted jambs with shaped panel above. The frieze with carved cartouche to centre and scrolled design to ends. Late 18th / early 19th century. 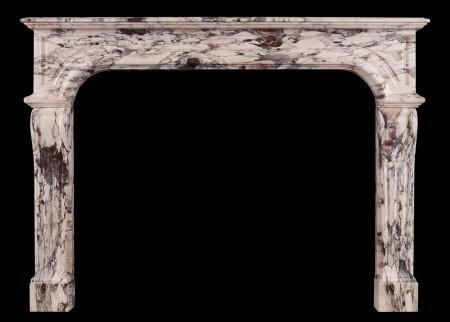 An 18th century Louis XV fireplace in a variegated Breche marble. The sweeping jambs with turned over leaf carving to tops and bases, the frieze with carved centre of flowers and foliage. Serpentine shaped shelf. 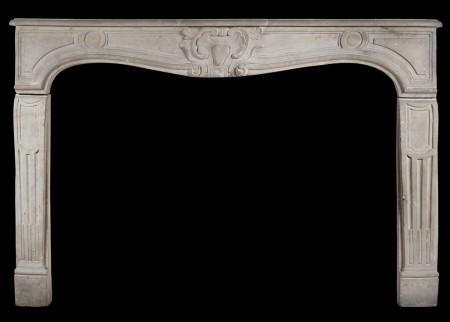 An 18th century French Louis XV fireplace in Languedoc marble. The panelled frieze with cartouche to centre, the shaped jambs with panels throughout. Shaped, moulded shelf. 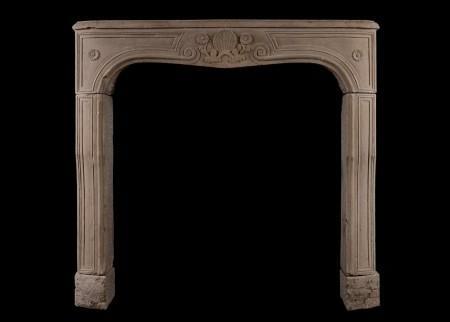 A 19th century French limestone fireplace in the Louis XV style. The panelled, carved frieze with cartouche to centre, the shaped jambs with stop-flutes and panels. Shaped shelf. Good patination of stone. A rustic French stone fireplace. The moulded, panelled frieze with stiff bellflower to centre and corresponding end blocks to sides. Plain panelled jambs. Circa 1900.